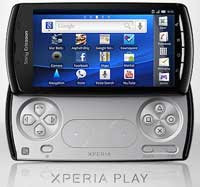 Handheld Addict: Xperia Play officially announced? IGN is reporting that the Xperia Play-- a.k.a the PlayStation Phone-- was revealed to the (American) public at large via an ad during Super Bowl XLV yesterday. hey it's a phone too! Now you GOTTA carry it around with you, amirite? In a way, the Xperia Play is a spiritual successor to the PSPgo. I still love my PSPgo (in fact I'm going to go play it as soon as I'm done writing this post) Merging it with a phone, and Android may be a good idea... it will definitely be a portable device, especially running Android. Not sure how useful the dual analogue touchpads will be, but I suppose they're mostly there for PS1 support. Sony is really hedging its bets with these 2 handheld directions. We have to understand that the handheld gaming market is way different now than when Sony entered it with the PSP in 2004/2005. Phone gaming is HUGE. Sure, people complain about the quality, but it's UNDENIABLE that the majority of gaming is done on peoples phones. Are these casual gamers who don't care about the latest Kingdom Hearts entry or other big game franchises? Maybe... ultimately, who cares? Nintendo & Sony have to scramble to adjust their handheld strategies to compete with the overlapping phone market. By cozying up to Google's Android, Sony might be on the right track with that. Still not sure how I feel about the Xperia Play though. I am warming up to it, but if I were to ever get one I think the majority of my gaming on it would be GBA emulated games, and using a free PS1 emulator. Playing GBA games on a virtual touchscreen D-pad is annoying.